David Cameron has made climate change and a "new politics" key parts of his future offer. But his candidates are reluctant to show their commitment to either issue. David Cameron has made climate change and a “new politics” centre pieces of his offer to the country. But his candidates are reluctant to show their commitment to either issue. 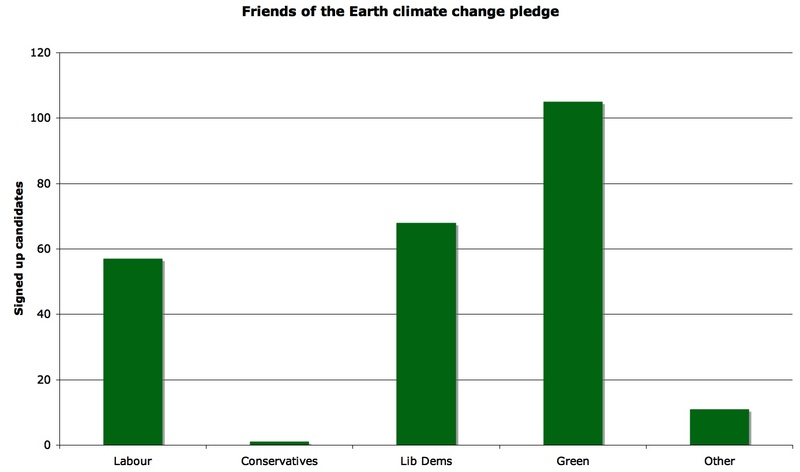 A blog on the Friends of the Earth website shows that just one Conservative candidate, Zac Goldsmith, has signed their four-point pledge on climate change. The pledge includes a commitment to achieve a reduction in UK greenhouse gas emission of 42 per cent by 2020. The pledge has been signed by 57 Labour candidates, 68 Liberal Democrat candidates, 105 Greens, and 11 other candidates including members of the SNP and Plaid Cymru. Meanwhile, the election web initiative DEMREF 2010 has revealed that the Conservative party’s candidates are “not taking democratic reform seriously”. So far just four Conservative general election candidates have taken part in DEMREF 2010, which was set up in February this year to allow voters to scrutinize and compare the views of parliamentary hopefuls on cleaning up politics. By contrast, 119 Liberal Democrat candidates, 83 UKIP candidates, 61 Labour candidates, 37 Green candidates and 16 independent/smaller party candidates have already openly stated their views on the DEMREF 2010 website. The four Tory candidates are Toby Bootle, Diana Cload, Ewan Lamont, and Jack Perschke. “Conservative candidates seem to be rather shy about sharing their reform ideas with the voting public. This is strange because the party has actually got things to shout about, as they did last week about giving constituents the power to sack their MPs. – A ComRes poll shows that only 7 per cent of Tory candidates believe the expansion of onshore wind is essential. – Political Climate shows that, “Those intending to vote Conservative are less likely to believe in man-made climate change, and less likely to be supportive of climate policies, regardless of how they are framed.” It has a nice graphic too. Will – Could it simply be that, in keeping with the majority of the public both here and in the US, the Tories don’t care about this stuff and are more concerned with things like the jobs tax Labour is proposing? Maybe, Anon. But why does Cameron continue to claim that you can ‘Vote Blue, Go Green’? Will – OK fair point dude…. Thus proving yet again that Cameron’s claim to have changed is just a load of nonsense.